The Irish Wolfhound is a breed of hound (a sighthound), bred to hunt. The name originates from its purpose rather than from its appearance: To hunt wolves. These dogs are the tallest breed, with a swift pace and good sight. They have a rough coat (gray, brindle, red, black, pure white, or fawn), a large arrow-shaped head, and a long, muscular neck. The breed is very old, possibly from before 1 CE, created by the Celts as Cu Faoil. Due to a massive export into various countries as a gift for royalty and a ban that allowed only royalty to own such a dog, the breed almost vanished in the middle of the 19th century. Captain Graham rebred the Irish Wolfhound with the Deerhound, Great Dane, and other breeds; this saved the breed, but had the inevitable effect of altering its appearance. Their average lifespan is around 10 years. Supplemental calcium shots, minerals, and vitamins need to be administered until a certain age. By the age of 8 months, the dogs appear adult, and many owners start stressing them too much. Outstretched limbs and irreparable damage are the result. Wolfhounds need at least 18 months to be ready for lure coursing, running as a sport, and other strenuous activities. In temperament, they are considered gentle and friendly, very calm in the house, enjoying long sleeps but energetic when taken for walks. They should be socialised from a young age so that they have a chance to gather experience. 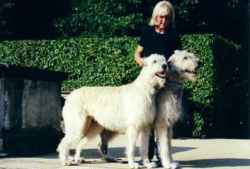 The Irish Wolfhound is the tallest dog in the world, a fact that sometimes is its biggest disadvantage when attracting owners who have no concern for its special needs. In competition, the minimum accepted height and weight for males are 81.25 cm (35 inches) and 54.5 kg (125 lbs). An Irish Wolfhound serves as the regimental mascot to the Irish Guards and accompanies the regiment in all of its parades.